Jason Droege came to UCLA in the mid-90s to study film and get away from the Bay Area’s tech culture That didn’t last long. As a student, he quickly became interested in the emerging internet’s commercial potential. He changed his major to computer science and he dove head first into an entrepreneurial career while still living in the dorms. With two decades and several successful starts-ups under his belt, Droege, who is Uber’s vice president of UberEverything, returned to UCLA on January 15. He spoke in front of a full house of UCLA Samueli Engineering students in the second program of the year in the Ronald and Valerie Sugar Speaker Series. 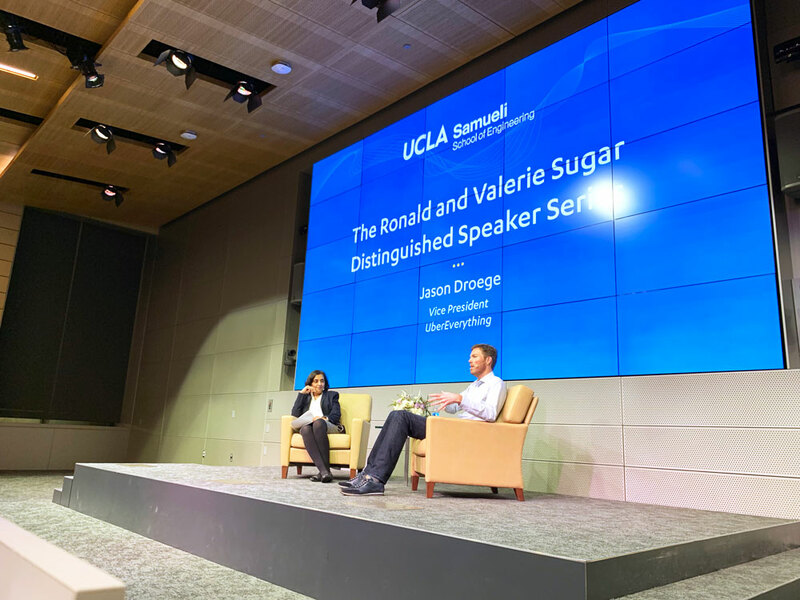 Droege was interviewed by Jayathi Murthy, UCLA Samueli’s Ronald and Valerie Sugar Dean of Engineering in the Dr. William Mong Memorial Auditorium. At Uber, he oversees Uber Eats, an on-demand food delivery app and website available around the globe. Before delving into his current role, Murthy asked Droege about his first business, Scour, which crawled the web to find MP3 files. That company, which included Uber founder Travis Kalanick, grew very large, very fast. The company only lasted a few years but Droege found his entrepreneurial calling in internet-based technologies. Following Scour, he held executive roles in e-commerce, enterprise software, and internet services companies. Still for the entrepreneurial-minded students in the audience, he offered cautionary advice on what they’ll face. In 2014, Droege joined Uber to lead their division called Uber Everything. It was started figure out what other businesses the San Francisco-based ride sharing company could venture into. That something is Uber Eats, an on-demand food delivery app and website that delivers food in as little as 31 minutes. Fast forward to today and Uber Eats has partnered with more than 160,000 restaurants, in 350 markets, across 35 countries and six continents. Its offerings range from mom-and-pop neighborhood favorites to global chains like McDonald’s and Starbucks.